If you've ever dreamed of running your own holiday park or escaping the city for a change of lifestyle, the Mains of Auchingoul could be the perfect purchase for you. New to the Aberdeenshire property market though CKD Galbraith, the sale includes an impressive traditional farmhouse along with a successfully operating holiday cottage portfolio all set in an idyllic riverside location. Set at the heart of the Deveron Valley, Mains of Auchingoul is an impressive detached farmhouse together with a range of steadings which have been tastefully converted into three separate holiday cottages as well as a further three detached log cabins. The farmhouse and holiday lets are set in about 11.3 acres of land, comprising of four paddocks suitable for equestrian or livestock grazing and delightful mixed species woodland. The current owners of the Mains of Auchingoul purchased the property some 14 years ago and since then have lovingly renovated the Farmhouse to create a wonderful family home. The Farmhouse has a bright and airy sun room, a sitting room and cosy open-plan kitchen / living room with a wood burning stove all on the ground floor. Moving upstairs to the first floor there are three good sized bedrooms, one of which is en suite and would make an ideal master bedroom. Opposite the Farmhouse there are a range of traditional farm buildings that were converted into two stunning holiday cottages. Adjoining the two cottages is an excellent general purpose store room and a gym. Nearby is The Bothy, a quaint and charming stone built farm worker's cottage which also provides superb holiday accommodation and is ideal for couples. 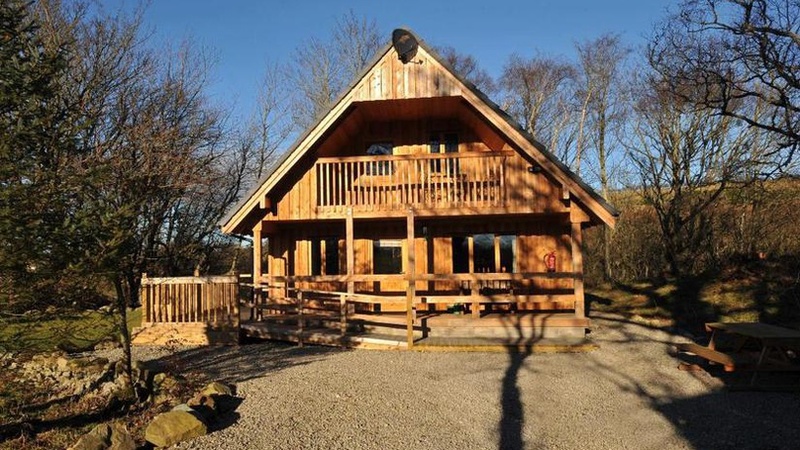 There are three further log cabins which enjoy an elevated position and views of the beautiful countryside and the River Deveron. Rod Christie, handling the sale of the Mains of Auchingoul for CKD Galbraith, said: "Over the last decade or so, the current owners have worked hard to create a wonderful and very successful holiday cottage business with many happy and repeat guests. "The grounds and buildings have been extremely well maintained and updated. Furthermore there are additional outbuildings which offer scope for further development and the owners have already gained planning permission to convert one of the steadings into another holiday let. "With such development potential and all the holiday business fixtures and fittings included in the sale, a buyer could begin operating the business immediately, making this a very attractive sale for many." The nearby village of Aberchirder provides excellent day to day facilities and the stunning coastal town of Banff (about 13 miles away) provide further local amenities and entertainment. The local area is famed for its dry climate and breath-taking scenery, long sandy beaches and recreational opportunities. Aberdeen airport is only 40 miles away and offers regular domestic and international flights. Main of Auchingoal is on the market for offers over 925,000.